In which your hero watches The Phantom Raspberry Blower of Old London Town to exorcise 20 years' worth of demons and it doesn't go so well. As a child, there was one part of the week that I really didn't particularly care for, and it was the 8-odd minutes that we spent watching The Two Ronnies whilst their ongoing The Phantom Raspberry Blower of Old London Town (first broadcast in 1976) was on. I was terrified of it. Literally rigid with fear. To this day, even seeing little clips of it gives me the shivers. I think that it is genuinely evil. I'm nothing if not a contrary old bird, though, and I have to admit that a lot of the visual style and themes of The Phantom Raspberry Blower have led me to a lifelong love of studying the Jack the Ripper case and other dark history, as well as a broader love of historical documentaries. I think that it is genuinely true to say that without spending an hour of my life in a state of cataplexy watching the Phantom, I would not be so interested in them. 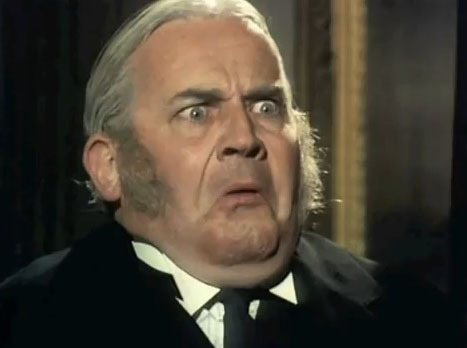 Watching and reading about Jack the Ripper scares me, too. Which is daft, since as a 31-year old male artist living in 2012 by the coast in West Sussex, I am significantly outside his target group of female prostitutes in the Whitechapel area of London in 1888. Dafter still: Jack the Ripper scares me because it reminds me of The Phantom Raspberry Blower. On Twitter today, my friend posted a link to a full playlist of the 8 episodes which made up the near future science-fiction strand The Worm That Turned, also from a later series of The Two Ronnies, on YouTube. This, in something of a running theme, also scared me as a child. But it reminded me of the Phantom, and knowing that he too would be lurking on YouTube somewhere that it could be a good time to face my fears. 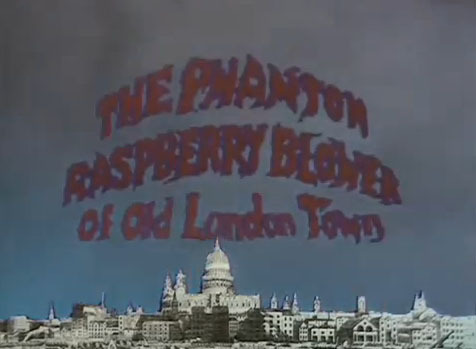 Like The Worm That Turned, The Phantom Raspberry Blower of Old London Town was made up of eight episodes of about 8 minutes duration. It was written by Spike Milligan, as some indication as to the level of lunacy that was the target of the series, rather than a gritty psychological terror. So yesterday evening I did some Googling and then watched it. Well, almost all of it. I watched the first 6 episodes - which I think have stood the test of time reasonably well, aside from some grindingly cheap casually racist and anti-Semitic jokes, which I increasingly find festoon much of Milligan's work - but then I went to the kitchen to get a drink. Seeing that dark corridor to my right brought it all back. I was a petrified child again. I could feel my heart beating in my ears. I had sort of hoped that this blog post would end in my personal redemption and I would rise like a moronic phoenix from the ashes of my own gormlessness. Predictably, however, it ended in me hiding in a well-lit room, too scared to go back outside of it. I may yet try and watch the remaining 20 minutes of the series and achieve some sort of closure (or some sort of seisure). But seeing as I seem to recall the final part of it terrified me to the point that I had screaming nightmares for the rest of the week, I don't hold out much hope. Honestly, BBC... you were still making new episodes of The Two Ronnies until 1987. What on earth were you doing, repeating stuff from 1976 in the late 1980s? So in a way it's your fault. I refuse to believe there were only 8 episodes of each.